You are here: Home › Blog › What is Cufon? Yea, that’s what I thought too. Chances are good that if you’re not into website design or development you’ll never come across cufon. And chances are also good that even if you are into web development you might never come across cufon. But since I am into site design and development and since I did encounter cufon, I thought it was cool enough to share with the rest of you. So what exactly is cufon? In my most basic understanding, cufon is a text replacement tool. More specifically, cufon is a font replacement tool since the actual text is not altered. It is useful for web designers who want to use fonts that are not web safe and do not want to use a image to display text. Web-safe fonts are fonts that are common to most browser. Sometimes website developers want to use “fancy” fonts that are not web-safe. The most common use of this is in logo design. 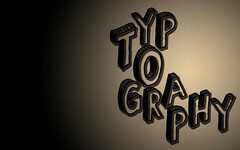 To display text using a font that is not web-safe a site creator will use a graphics program to create an image then display that image to all users. Where can I see cufon? When ‘cufonizing’ a font be sure to include a set of special characters if you think you’ll need them. Same goes for characters in other languages. See how the font is different? The font you see in this image is a web-safe Arial font. The font you see in the first two examples (and the active font used in the rest of my posts) is a non-web-safe font called Chunk Five. When the page loads, a short script is executed that replaces the Arial font with the same text using the Chunk Five font. The end result is that you see a nicer looking website. Simple answer: design. My first thought was that this would be useful for displaying logos as text. However, after thinking about it for a bit, logos are probably not the target solution because (1) logo text is usually short and can be added in the ‘alt’ tag property and (2) logos usually contain graphics other than text. I don’t think it would be good for paragraph text. I say this because looking at the source code of post-cufonized text, there seems to be a lot of overhead involved. Long blocks of text could take a long time to re-image as the cufonized version and people visiting your site could get tired of waiting. My guess is that cufonized text is probably best suited for headings (like on this site). In a heading situation we might want a little more design than regular font but don’t want to take the time to create an image every time we create another heading. Cufon is a great solution for this.